Staying healthy in the fall can be a real challenge. The leaves are changing colors, blustery winds are rising, and nothing sounds better than curling up next to the fire with some hot chocolate/fondue. As if that weren’t enough, Fall is also football season which means countless hours spent eating junk food and drinking beer at tailgates or on your couch. And finally, arguably the two worst holidays for unhealthy eating – Thanksgiving and Halloween – occur during the very same season. One involves purposefully wearing pants that are a couple sizes too large. The other revolves around seeing how much sugar you can collect. 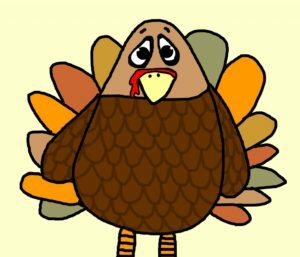 Since we’ve already had articles focusing on how you can have the healthiest tailgates and Halloweens possible, we’re now going to walk you through how to avoid Thanksgiving health pitfalls – the Flow Natural Health Care way! Put away your turkey-eating pants and get ready to do Thanksgiving differently this year. Eating with intent is the best way to consistently make healthy choices. If you plan your meals out the night before, you’re far less likely to hit your nearest McDonald’s once you start growing hungry in the afternoon. Planning out a full week’s worth of meals is even better and will ultimately save you so much money on your groceries and food budgets. All this applies doubly to Thanksgiving. Coming in with a set goal of not getting seconds on mashed potatoes or not heaping more than two servings of any one thing onto your plate significantly increases your odds of not over consuming as well as saving money on Thanksgiving ingredients. Wake up early and go for run. Take your uncle’s dog for a pre-meal walk. Light up your little cousin who was foolish enough to run a route across the middle on a pivotal third-down during the annual Turkey Bowl family football game. Whatever you do, try to make it active. It doesn’t take much activity to burn off large amounts of Thanksgiving calories so make sure you spend some time out of your chair and on your feet. If you help cook a meal, you are less likely to overeat during it. According to the Harvard Health Blog, eating while distracted typically leads to ingesting hundreds of extra calories. The more you are mindful of what you’re eating and the entire meal process, the quicker your body will react to your stomach filling up. 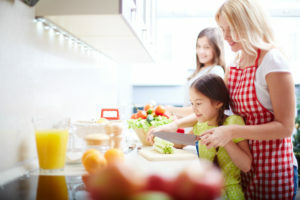 The cooking process also jump starts your body’s metabolism. 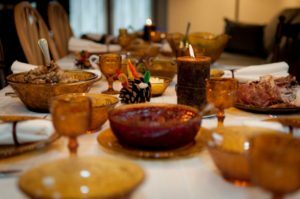 So whether you’re making the mashed potatoes or the fruit salad, just being a part of the process could seriously amplify your ability to resist the allure of Thanksgiving engorging. It’s often said that it’s not our stomachs that count calories but our eyes. That’s because hunger is actually more stimulated by what our eyes see than what our stomachs feel. In an incredibly interesting study called “Bottomless Bowls,” subjects were instructed to eat soup until they were full. Some of them were given a bowl that automatically refilled itself through the bottom. No matter how much soup they drank, it appeared to them as if they still had more in the bottom of the bowl. Although they believed they’d consumed the same amount of soup as always, subjects with a refilling bowl actually drank a whopping 73% more soup than those with a normal one! How can you apply these findings to your Thanksgiving? It’s easy – just use a smaller plate. Studies show that with this simple trick you’ll eat 22% less food. Our stomachs are visually triggered by our brains. So when there’s still food on your plate, your stomach tells your brain you’re hungry even if you’re not. Smaller plates fix this! Thanksgiving is an all-day affair that usually entails grazing on appetizers while waiting for the main event. Consider holding out on the appetizers that you can eat all year long. Why spend precious stomach space on cheese and crackers when there are so many more Thanksgiving-specific dishes to eat? Look, we get it. The holidays are a time for family, and sometimes your family drives you to the bottom of the deepest bottle. 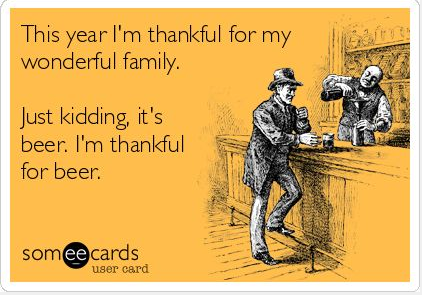 While understandable, alcohol can easily lead to an unhealthy and potentially regrettable Thanksgiving. 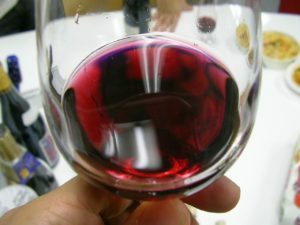 Not only are alcoholic drinks chock-full of calories, but you eat more food when you’ve been drinking because you’re less focused and eat with less intent. While drinking, you’re less likely to eat fruits and vegetables, more likely to skip meals, and less likely to properly hydrate. On average, men who drink with their meals eat up to 30% more. If that’s during a normal meal, imagine what Thanksgiving could look like. Limiting yourself to two drinks throughout the day is a great way to take the edge off while still imbibing responsibly. Maybe the most important thing to remember is that you should relax and focus on what Thanksgiving is really about: family, good food, and giving thanks. (And to a lesser extent, football and Charlie Brown). Stressing about a couple extra calories just isn’t worth ruining a great holiday over. The worst thing you can do is let one poor eating day crush the positive momentum you have going for yourself and derail future healthy living plans. Understand that if there was ever an excuse for a cheat day, Thanksgiving is probably it. Enjoy your Thanksgiving, eat with intent but don’t overly stress about it, and keep striving for healthy living in the days after.